Leaves basally white with pink or red, otherwise bright green; single midvein (secondary midrib) prominently raised above leaf surface, usually somewhat off-center, other veins barely or not raised; cross section rhomboid. Vegetative leaves to 1.75 m; sheathing base (proximal part of leaf) 22.1--66.5(--73.3) cm; distal part of leaf 31.9--95.8(--117.6) ´ 0.5--2 cm, 1.4--1.8 times longer than proximal part of leaf, margins sometimes undulate or crisped. Sympodial leaf (29.9--)34.7--159.1(--183.9) cm, usually shorter than to nearly equal to vegetative leaves; sheathing base 16.1--76.4(--100.1) cm; distal part of leaf 13.5--86.2(--101.2) ´ 0.4--1.9 cm. Spadix (3.8--)4.9--8.9 cm ´ 5.3--10.8 mm at anthesis, post-anthesis spadix 5.5--8.7 cm ´ 6--12.6 mm. Flowers 3--4 mm; pollen grains not staining in aniline blue. Fruits not produced in North America. 2n = 36. Flowering early spring--early summer. Wet open areas, marshes, swales, and along edges of quiet water; 0--900 m; introduced; N.B., N.S., Ont., Que. ; Ala., Ark., Calif., Colo., Conn., Del., D.C., Ga., Ill., Ind., Iowa, Kans., Ky., La., Maine, Md., Mass., Mich., Minn., Miss., Mo., Nebr., N.H., N.J., N.Y., N.C., Ohio, Okla., Oreg., Pa., R.I., S.C., S.Dak., Tenn., Tex., Vt., Va., W.Va., Wis.; Europe; Asia; Africa; Indian Ocean Islands; Pacific Islands. 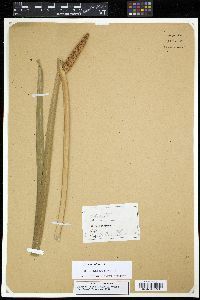 Acorus calamus, a sterile triploid, was introduced to North America by early European settlers, who grew it for medicinal uses. Rhizomes propagate easily, and the species has spread throughout northeast and central United States. Scattered populations occur elsewhere. 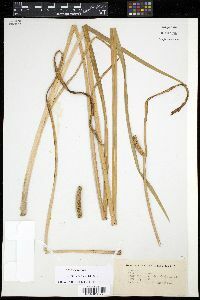 Although leaf and spadix size of A. calamus and A. americanus overlap, those measurements differ significantly, with A. calamus in general having longer and wider leaves and longer spadices. Perennial herb to 1.8 m tall Leaves: crowded at the base, fanning out from the base like iris leaves, white to pink or red at base, becoming bright green, to 1.8 m long and 2.5 cm wide (sheath base 22 cm - 0.67 m long), lance-shaped, sometimes wavy or crimped, with a single prominent vein that is slightly off-center and inconspicuous lateral veins. Flowers: borne on a cylindrical spike with a very fleshy axis (spadix) arising at the junction of the scape tip and spathe. The spadix is 5 - 9 cm long and 5 - 11 mm wide. Individual flowers numerous, with six tiny (3 - 4 mm) and yellowish brown tepals. Fruit: not produced because the species is a sterile triploid (three copies of each chromosome). Rhizomes: branched, growing horizontally at or near surface, containing a sweet aromatic oil. Flowering stem: (scape) arising from base of plant, resembling a leaf, shorter than or almost equal in size to vegetative leaves, triangular in cross-section. A long, green, flattened, sheath-like structure (spathe) continues vertically at the tip of the scape. Similar species: Acorus americanus and Acorus calamus are very similar, and are sometimes considered the same species. However, there are a few distinctive characteristics that are used to distinguish the two species. Acorus americanus is a fertile, diploid (two copies of each chromosome) species that produces mature fruit. Its leaves have two to six prominent veins. 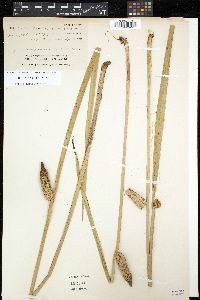 Generally, A. americanus has shorter and narrower leaves and shorter spadices than A. calamus. Habitat and ecology: This species was introduced from Europe by early settlers. It is easily propagated by rhizomes and has spread across the northeastern and central United States, with a few scattered populations located in the west. In the Chicago Region, the plant grows in cattail marshes, calcareous open marshy areas, old stable marshes, and low areas. Notes: European settlers brought this species to North America for medicinal purposes. Etymology: Acorus is the Latin form of the Greek word, akoron, an ancient plant name. Calamus comes from the Greek word, kalamos, meaning reed.